This is one of the most common questions I get from parents of 6 and 7 year-olds. Even though there are multiple reasons why your child’s permanent teeth are yellow, the most common reason is the intrinsic color difference between the permanent teeth and baby teeth. This yellow appearance is also enhanced by the fact that they sit right next to baby teeth. This contrast between they very white baby teeth makes the grown up teeth look even more yellow. 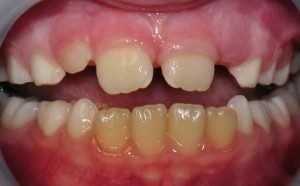 Primary teeth have a milky white appearance when compared to the sometimes yellowish appearance of the permanent teeth. Primary teeth have thinner enamel, less amount of dentin and dentin in primary teeth is less yellow in color. Permanent teeth have a greater amount of dentin, which is yellow in color. Since enamel is translucent the color of the dentin shows through. When all the permanent teeth have erupted the color will blend and appear uniform. Young permanent teeth have very large nerve canals when they erupt and these teeth are more transparent, leading to a yellower appearance. As we age, the canals slowly calcify and the tooth will naturally lighten. As for bleaching, we advise parents to wait until all of their permanent teeth to erupt (usually 12/13). Otherwise when the new adult erupt, they will not match his bleached primary teeth.